Are your people working smarter or just harder? Regardless of industry, organizations are dealing with constant change. Customers have higher expectations, employees are spread out, and costs are always a concern. You need a modern workplace—responsive and dynamic—to meet new needs around communication, collaboration, and security. 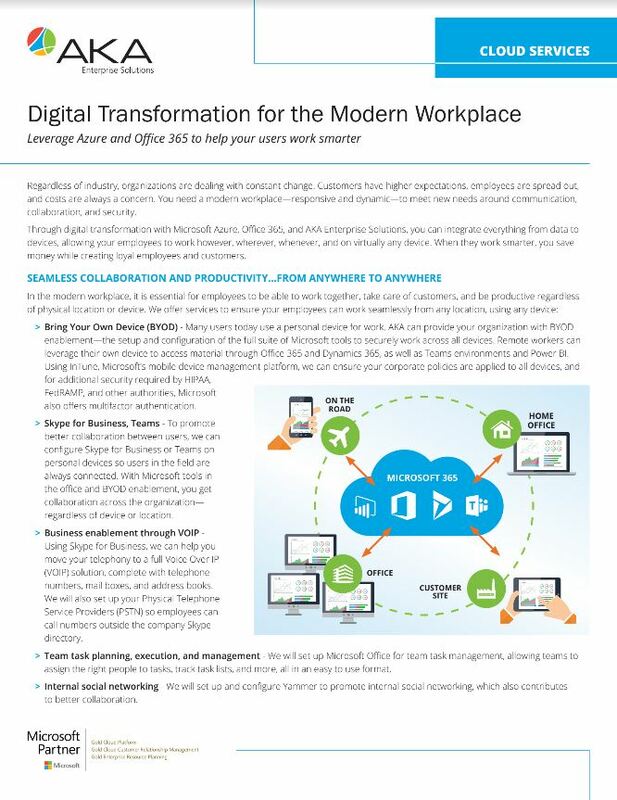 Through digital transformation with Microsoft Azure, Office 365, and AKA Enterprise Solutions, you can integrate everything from data to devices, allowing your employees to work however, wherever, whenever, and on virtually any device. When they work smarter, you save money while creating loyal employees and customers. Bring Your Own Device (BYOD) – Many users today use a personal device for work. AKA can provide your organization with BYOD enablement—the setup and configuration of the full suite of Microsoft tools to securely work across all devices. Remote workers can leverage their own device to access material through Office 365 and Dynamics 365, as well as Teams environments and Power BI. Using InTune, Microsoft’s mobile device management platform, we can ensure your corporate policies are applied to all devices, and for additional security required by HIPAA, FedRAMP, and other authorities, Microsoft also offers multifactor authentication. Skype for Business, Teams – To promote better collaboration between users, we can configure Skype for Business or Teams on personal devices so users in the field are always connected. With Microsoft tools in the office and BYOD enablement, you get collaboration across the organization—regardless of device or location. Business enablement through VOIP – Using Skype for Business, we can help you move your telephony to a full Voice Over IP (VOIP) solution, complete with telephone numbers, mail boxes, and address books. We will also set up your Physical Telephone Service Providers (PSTN) so employees can call numbers outside the company Skype directory. Team task planning, execution, and management – We will set up Microsoft Office for team task management, allowing teams to assign the right people to tasks, track task lists, and more, all in an easy to use format. Internal social networking – We will set up and configure Yammer to promote internal social networking, which also contributes to better collaboration. We know how important it is to protect your assets. With Microsoft, that’s never a concern. With comprehensive security measures in place, your data, apps, and devices—including personal devices used for work—are safe and secure. AKA will also work with you to ensure a secure configuration. 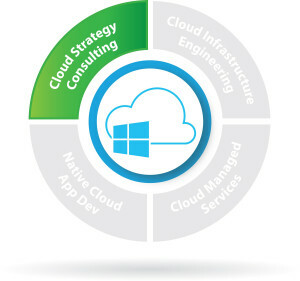 Azure Active Directory is the tool of choice for organizations that want users to be able to use their corporate credentials across Google and Microsoft. We can configure it so you get that ability, but in a trusted, secure configuration. We can also migrate your email from nearly any mail solution into Office 365. We use the power of the Microsoft platform—including Office 365 and other tools like Flow and Logic Apps—to automate business processes using task lists, planners, email triggers, reminders, notifications, and document collaboration. But we start by doing a full business process analysis to ensure the automation we’re implementing will maximize your ability to be productive. This includes examining other how other systems, like CRM, come into play. How do you support remote workers? Do you understand how to use video conferencing for employees working at home versus using surface hubs in a conference room? How do you ensure user adoption? At AKA, we understand that great technology will only get you half way there; you need to understand how to use that technology to its fullest. That’s why AKA provides guidance and training as part of our Modern Workplace service. We work closely with you to understand your processes, needs, and goals so we can ensure your solution is the right fit. When that solution is up and running, we will provide collaboration workshops that will teach you how to use technology and business process enablement to be more effective with remote users. In the end, our goal is to make sure you are delighted you chose Microsoft and AKA.